Hybridization, (i.e. the combination of offline and online channels of engagement) is more likely to promote a wider diversity of participants. However, the key to improve the inclusion of participants is not the quantity of channels of engagement, but rather their quality, centrality, salience, and effective integration with one another. 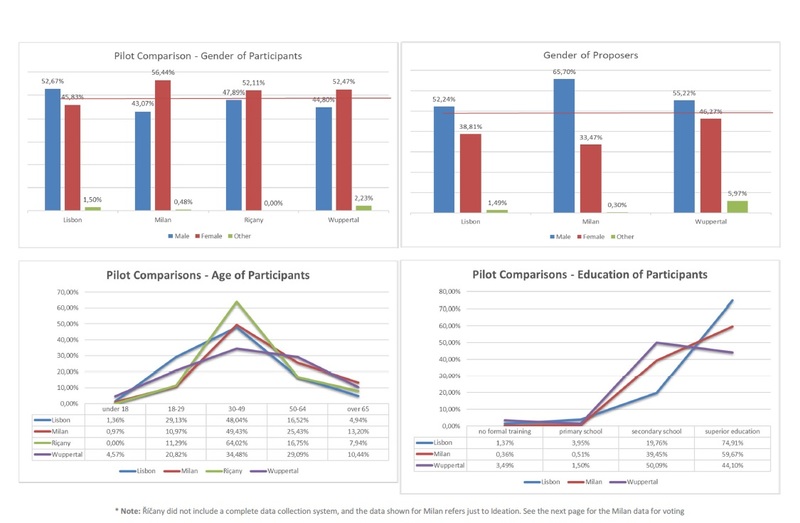 The participatory processes facilitated by EMPATIA on average engage more women than man in the voting phase. However, the trend is completely different if we look at the gender of the proposers in the ideation phase, where the males are always the majority. This suggests that many of the claims of practitioners that participatory processes are capable to overcome gender bias need further investigation. Only with the advanced monitoring capabilities of the EMPATIA project it was possible to highlight this issue. It is crucial that future participatory platform implement similar monitoring capabilities, otherwise gender discrimination might remain hidden. On average the participatory processes promoted by EMPATIA have struggled to engage elderly people and people with lower educational attainment. The pilots that promoted hybridization show better results. Wuppertal achieves the best results among our pilots for education. 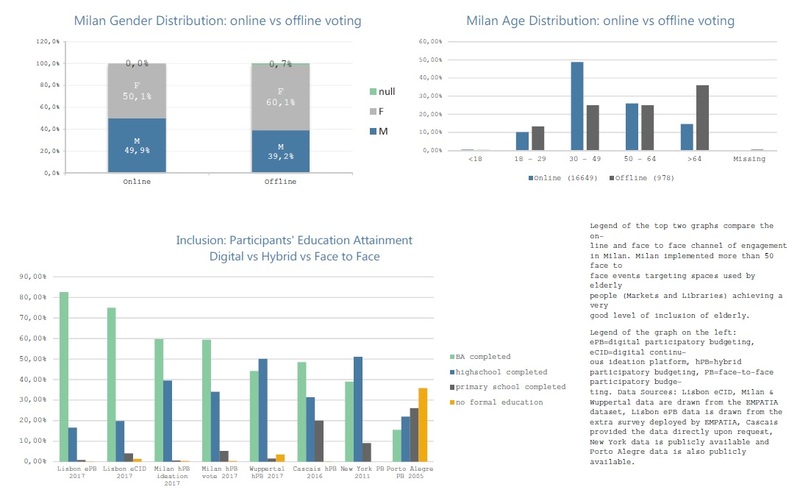 While Milan that deployed during the vote a specific strategy to engage elderly people in marketplaces achieve the best results with respect elderly inclusion. Thus, the EMPATIA research teaches us that inclusion is possible, but it requires a hybrid approach combined with customized outreach strategies that target difficult to engage population. The pilot in Wuppertal has overall the best inclusion results. Wuppertal achieves level of inclusion that are close to famous best practices that have focused their strategy on inclusion such as New York City and Cascais in Portugal. It is interesting to note that, from a quantitative standpoint, Milan implemented 30 face-to-face events during the ideation phase, while Wuppertal implemented only one. The difference between Wuppertal and Milan was in the design of the face-to-face events. While most of Milan face-to-face events were designed to offer support and information, Wuppertal invested on a few curated deliberative events that had crucial impact on the process. Thus one lesson we can draw from the EMPATIA research on inclusion is that the quality of the participatory channels is often more important than their quantity.